The company will spend $7 million on improvements designed to ease congestion. Casco Bay Lines wants to start the second phase of an expansion project begun almost a decade ago. The public ferry company plans to add a second floor to the terminal on Commercial Street, extend the ferry pier, repair the pier structure and improve pedestrian and traffic circulation. Passenger, vehicle and freight volume has grown year over year and the small terminal needs to reconfigure to stay efficient, said Casco Bay Lines General Manager Hank Berg. Ferry officials planned to add second-floor office space and other improvements when it expanded the passenger waiting area four years ago, but didn’t have the money on hand, Berg said. Since then, the company has come up with $7 million it needs for the upgrades, about 80 percent funded by federal grants, Berg said. Increased demand for the ferry service, especially by day-trippers headed to the islands, led to long lines at the terminal last summer. During one three-hour period over the Fourth of July, nearly 2,000 people rode ferries to Peaks Island alone. Administrative offices on the terminal first floor will be moved to a 5,809-square-foot second floor, to make more space for freight storage and handling, Berg said. A 2,300-square-foot pier extension will include a new ferry boarding gate. Deteriorating pilings, pier supports and decking will be replaced and new drainage installed, according to a project summary filed with the city’s office of planning and urban development. Vehicle traffic into the terminal waiting area and attached parking garage will be streamlined with a clear thruway and well-marked pedestrian and freight entrances. If the project gets city approval, Casco Bay Lines intends to start construction this winter, Berg said. 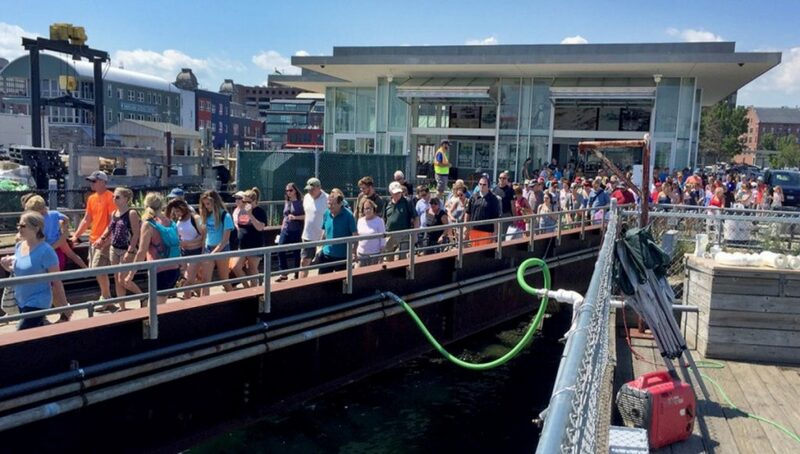 Last year, the ferry’s four vessels carried more than 1.1 million passengers, 35,000 vehicles and 500,000 pieces of freight between Portland and islands in Casco Bay. With that level of traffic, the proposed improvements are the best the company can do right now, Berg said. “Is it the answer to everything? No, the only way is to get new real estate and that isn’t an answer now,” he said.